Rebels Review: "The Protector of Concord Dawn"
It was Mando-mania this week on Star Wars Rebels, as the show continued its exploration of Sabine's past while introducing a new faction into the series. "The Protector of Concord Dawn" was a solid--if exposition heavy--episode, and sets up some interesting plotlines for the series to explore down the road. The star of this week's episode was Sabine, who feels guilty after her suggestion to reach out to the Mandalorians backfires and Hera is injured. Seeking vengeance, Sabine visits the Mandos on Concord Dawn with Kanan, although he turns out to have a more diplomatic solution in mind. Sabine's backstory remains a great mystery on the series and "The Protector of Concord Dawn" continues to explore her past by offering us a glimpse into her heritage. We learn that Sabine forged her armor on Mandalore with her family either before or during her time at the Imperial Academy. We know from previous episodes that a horrific experience drove her to run away from the Academy with Ketsu Onyo (seen in "Blood Sisters"), but the details of that event remain shrouded in mystery. 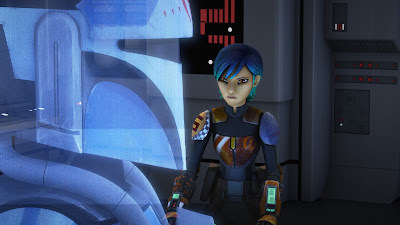 What we do know is that Sabine had trust issues stemming from this experience, as we learned in Season One. We also know that Sabine--and Mandalorians in general--are fiercely loyal. In this episode it is clear that Sabine is past whatever trust issues she may have had and is loyal to the Rebellion, and Hera in particular. With all of that in mind, her reaction to Hera's injuries makes perfect sense. Sabine both blames herself for suggesting Concord Dawn as a potential route for the Rebels, and fears she may lose one of the few people she actually trusts. Her strong reaction also gives us a glimpse into what Sabine may be capable of when she swears revenge on Hera's attackers. "The Protector of Concord Dawn" provides our first real chance in the series to explore the relationship between Kanan and Sabine. In many ways, the pair represents what the Rebellion is all about: people of diverse backgrounds coming together the fight a greater evil--The Empire. History suggests that Kanan and Sabine should be enemies. Mandalorians and Jedi fought many wars against each other in the ancient times of the Galaxy, and more recent history demonstrated Jedi-hatred remained a time-honored Mando tradition (both Obi-Wan Kenobi and Ahsoka Tano clashed with Mandos during the Clone Wars). However, this episode shows just how close Kanan and Sabine are, with their relationship existing somewhere in the brother/sister, father/daughter range. That's not to say they don't possess different philosophies when it comes to handling conflict. This episode shows Kanan relying on his Jedi roots and choosing diplomacy to deal with the Mandos, while Sabine's first instinct was to fight them. Kanan sitting down with Fen Rau, the titular Protector of Concord Dawn, and trying to convince him to join the Rebel cause, seems to echo the sentiment of Obi-Wan's line from A New Hope, "there are alternatives to fighting". Yet the episode did a good job and showing the relative strengths and weaknesses of the two philosophies as Kanan seemed to be on the verge of convincing Rau to join the Rebel cause when a mistake by Sabine, who was planting explosives to destroy the Mandalorian's fighters, made some level of action inevitable. It was interesting to see Kanan in the role of diplomat. He had been given the nickname "the cowboy Jedi" before the series started, but this episode shows how far he has come since then. Kanan has matured throughout the series, training Ezra and taking on more responsibility in the Rebellion. This episode gives us an example of when he truly uses his Jedi training, not to kill stormtroopers with his lightsaber, but to reason with someone to find a solution to their problem. But if that's the case, it raises another question: why do the Mandos on Concord Dawn call Sabine a traitor? She declares herself to be House Vizsla, which they connect with Death Watch. It seems that Maul's supporters still called themselves Death Watch after Pre Vizsla's death, so it makes sense that Death Watch would be considered traitors. But the Mandos draw the connection to Death Watch from House Vizsla. I don't see a situation where the Jedi supported Darth Maul's Mandos during the Siege, so why does House Vizsla mean traitor? It could be, perhaps, that the Vizsla name is just so associated with Death Watch that that's the obvious connection to make. However, it may also suggest that maybe the Death Watch members that supported House Vizsla refused to support the Empire and that's why these particular Mandos would brand Sabine a traitor. This is really the main post-Maul takeover question I have about what happened on Mandalore. Regardless, the Republic eventually recruited Mandalorians to train Clones (a nice nod to "Legends") and to fight alongside their troops in the war. Kanan mentions being saved by Fenn Rau during the third battle of Mygeeto, which was seen in Kanan - The Last Padawan #10 from Marvel Comics (which just so happens to have been released on the same day as this week’s Rebels episode). Once the Empire took over it would seem they continued the Republic's occupation of Mandalore and, based on comments from the Story Group’s Pablo Hidalgo on Rebels Recon, installed a puppet leader to maintain order, while recruiting the Protectors to fight for the Empire. All that leads me to my only criticism of this week’s episode--the pacing. All of the exposition I just laid out was an insane amount to be crammed into a single episode. In a way, I don't blame the series for this; quite frankly, it was needed after the way things were left when The Clone Wars was abruptly ended. And the writers did a very good job at making the inclusion of so much explanatory material seem natural. Kanan's conversation with Fenn was superb, and even having Rex and Kanan reminisce a little about the Clone Wars was a natural way to convey some of the missing history to the viewer. Still, because of the need to include all this, the ending of the episode felt a little rushed, and we didn’t get any sort of resolution between Sabine and Fenn. And the whole Mandalorians-working-with-the-Empire plot line was wrapped up just a little too neatly--not that I expect things to stay that way for long. Rebels has done an excellent job this season at letting scenes breathe and giving us great character moments, and this episode was no exception. The Western-inspired conversation between Kanan and Fenn was a perfect example. That being said, what "The Protector of Concord Dawn" really needed was an extra 3-5 minutes to properly resolve the plot in a satisfying way that sets the stage for future episodes. While I don't expect the Mandos to have much of a presence during the rest of this season, I wouldn't be surprised if they came back in a big way in Season Three. "The Protector of Concord Dawn" is, overall, a solid episode. It does a good job at conveying the massive amount of necessary exposition left by the premature cancellation of The Clone Wars, while still exploring the psyche of our heroes and introducing a new faction into the mix for future conflicts on the show. Unfortunately, the weight of exposition is too much to bear and the ending winds up feeling rushed. Still, it's a good outing from Rebels that could turn out to be far more important than we currently realize. I thought it was a great episode. I'm starting to think they should extend them to an hour show rather then just 1/2 hour.